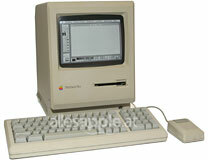 Major League Baseball and the Macintosh: Has the Magic Faded? Baseball is starting up again this week, and it's got me to thinking about the respective erstwhile magic of baseball and the Mac. I came late to both baseball and the Mac. Famously unathletic, I avoided stick and ball sports as much as possible through my childhood, teenage years, and young adulthood. What eventually hooked me on baseball (in my early thirties) was the 1985 pennant race, in which the Toronto Blue Jays looked like they had a reasonable shot at the American League championship. I am not a rabid Canadian nationalist, but the novel prospect of a Canadian team (albeit manned by mostly American and Dominican players, with nary a Canadian among them) making it to the World Series of that iconic American game piqued my interest. For the first time in my life, I sat down in front of the TV to watch a baseball game. I was instantly smitten. I'd never paid any serious attention to baseball before, but this was wonderful! I had never imagined that baseball, of all things, could offer the spectacle of such poetry in motion; such drama; such suspense. It was magic. I watched every game of the 1985 League Championship Series, and even after the Kansas City Royals beat the Jays in seven gladiatorial confrontations, I switched my allegiance to them and went on to watch KC pull off an underdog victory over the mighty St. Louis Cardinals in that year's all-Missouri World Series. A particular pleasure was watching Kansas City closing pitcher (and part-time philosopher), the late Dan Quisenberry, with his mesmerizing submarine delivery. As I said, I was hooked. I actually went through withdrawal when the 1985 Series ended. I wanted more baseball! Never one to do things by halves, I jumped into baseball with both feet and begin to read books about baseball seasons past, particularly the lyrically literate documentaries by Roger Angell. I immersed myself in baseball lore. I've watched Field of Dreams more times than any other movie since I was a kid. In April 86, I was tuned in for the first pitch of the Jays opener and barely missed a game all season - which culminated in long-suffering Boston Red Sox fans' hearts being broken again when Bill Buckner let a slow-rolling grounder pass between his legs at first base unhindered, allowing the New York Mets to rally and go on to win Games 6 and 7. High drama! BoSox fans would have to wait until 2004 for their loyalty to finally be requited. For the next several years, from April through October, baseball became the background music to my life. I discovered that I liked listening to baseball games on the radio as much as - or even more than - watching them on TV. Summer evenings were accompanied by the sounds of baseball games on often distant and staticky AM stations with the volume turned down low, but not so low that I couldn't keep track of what was happening by the sound of the crowd, while I read or wrote or did other things. I have to admit that there were times I would have the radio tuned to one game and the TV tracking another with the sound turned off. I was besotted by baseball. It was magic. I loved it. Each game was an adventure - unpredictable, with so many potential variables. It was like a novel unfolding before your eyes and/or ears. Sometimes it was a gripping page-turner; sometimes slow and tedious, but never really boring. And then there was all that tradition; the statistical minutia. It was, to coin a cliché, a rich tapestry. I loved the deliberate contemplativeness of it, with the action interspersed by long periods of strategic anticipation. Baseball was and is the thinking man's game. The late A. Bartlett Giamatti, former president of both Yale University and the National League, and briefly Baseball Commissioner for a short time prior to his tragic and sudden death, wrote: "I've been a lover of baseball, I've even tried to write about it . . . I always found it the most satisfying of games outside of literature." Or as a philosophy professor friend of mine who has also been a lifelong baseball fan whose family made pilgrimages from Nova Scotia to Fenway Park in Boston when he was a kid, once beatifically observed: "It's a beautiful game." For me, the high water mark of my baseball fandom was when the Jays actually did make it to the World Series in 1992 and went on to beat the favored Atlanta Braves; they came back in 1993 and prevailed again, this time over the Philadelphia Phillies. Unhappily, 1993 was the last really classic year of baseball for me, and as it turned out, for a lot of other fans as well. In 1994, a lot of the magic died along with that year's World Series, which was canceled because of a players' strike in a year when it looked like the other Canadian MLB franchise, the Montreal Expos, had a better than decent shot at winning the Series for the first (and, as it turned out, only) time. Come 1995, I tried to rekindle my enthusiasm, but my heart just wasn't in it anymore the way it had been, and the magic has never returned. I don't watch baseball much any more, and the radio is silent on summer nights now, although I do scan the box scores and division standings every day in the paper during the season. Of course, the Internet probably has had something to do with this, but not entirely. Indeed, baseball had fallen on hard times in general, with half-empty stadiums (on good nights) in many major league cities and a severely eroded TV audience. Major League Baseball resorted to gimmicks like inter-league play in the regular season and the post-season wildcard, as well as unwarranted team expansion, in attempting to keep the money machine primed, this all further adulterating the game's traditions and diluting the quality of play. Money, especially TV money, along with free-agency and owner arrogance, ruined baseball - a victim of its all too ephemeral pre-1994 bonanza of TV revenues and temporarily renewed public enthusiasm for the game. I still love the game. I'm just turned off by the mercenary crassness and arrogance of the people who organize and play it at the major league level. So what do these musings have to do with the Mac? Well, I bought my first Mac, a used Mac Plus, in 1992, more than eight years after the first Macintosh debuted. Like my latecoming introduction to baseball, that little Mac with its tiny, razor-sharp 9" 1-bit screen was a revelation. Upgrading from a command line driven Wang word-processor, the Mac metaphor of the Graphical User Interface and mouse allowing the user to virtually reach inside the machine seemed like magic to me. I was hooked. As with my baseball enthusiasm, I immersed myself in Mac lore. I read books, subscribed to Macworld magazine, and fell in love with the machine. In addition, being a Mac user was like joining a club. It reminded me of the days back in the 1950s and 1960s when owners of British sports cars (another of my preoccupations) would wave and flash their lights at each other when meeting on the highway. Then came the return of Steve Jobs and the start of Apple's Phoenix-like recovery from its corporate near-death experience. It is difficult to gainsay Mr. Jobs' handling of Apple's revival. The hardware became arguably ever more appealing, and he's kept it up for more than a decade now. The Mac OS is better than it has ever been as well, with OS X taking us into another galaxy performance-wise, and the Mac's market share is almost back to where it was in Apple's early 90s heyday. And yet, for me at least, some of the magic is gone. This is not a new epiphany. I can't put my finger precisely on when the light began to fade - perhaps it was the deal with Microsoft that Steve Jobs announced at Macworld Expo New York in 1997, when there still was a Macworld Expo New York, or Apple Legal's bullying of the Mac rumor sites and Simon Jones's erstwhile MacCards web site, or the fact that Macs are mostly (perhaps entirely?) made in Taiwan and China now, rather than in California. I expect it's been a cumulative effect of all these things and more, which leaves me with conflicted feelings about being an Apple advocate. Please note well that I am not saying that the actions described in the previous two paragraphs were not sound business moves, at least in the short term, but what I am talking about here is how I, and on the basis of considerable evidence, a lot of other veteran Mac fans feel about them. I still love the Mac OS and Mac hardware; I am just turned off by the sometimes mercenary crassness and arrogance of the company that manufactures and sells them. Yeah, I know: "Apple is a business." So is Major League Baseball. And I expect that from an MBA perspective, the Major Leagues' big money TV deals and the players' concomitant salary demands made perfect business sense. Except for one thing: They killed the magic, and to some degree killed the game, or at least a lot of the magic of the game at the major league level, which ultimately had to be bad for business. This article poses an inexact analogy, because so far Apple has not experienced any notable negative consequences business-wise from its hard-nosed, no-nonsense corporate policies of the second Jobs era. On the contrary, the company has gone from strength to strength, increasing market share, and is fairly rolling in cash. However, these days it's more and more like just another computer company, and its computer hardware an awful lot more similar to PC machines (by dint of the fact that internally they're now pretty much the same), which puts a damper on the sort of magic distinctiveness of Macs of yore that engendered traditional enthusiasm and loyalty of Mac aficionados. That's Apple's prerogative, and so far it's been a good ride for stockholders, which I hope will continue. And the Mac OS is definitely still special - I just miss the fun of the old days.